Business value is an estimate of the economic value of an owner’s interest in a business, based on an ‘arm’s length’ transaction where a buyer and seller, freely agree upon a value with access to all information. The American Society of Appraisers, the Institute of Business Advisors, and the National Association of Certified Valuation Analysts, use three approaches to estimate a business’ fair market value: one, the income approach which views the income stream; two, the market approach which views the selling multiples; and three, the asset approach which views the asset value. The asset approach to value is used where the assets provide for most of the value. This would be true for real estate holding companies, a retail shop that owns a valuable parcel of land, startups with no history, forced liquidations, etc. Asset appraisals are best performed by industry specialists familiar with the assets being appraised. An ongoing business is normally valued by the income and market approach to value. Still, undervalued assets on the balance sheet should always be adjusted to represent the full value of the asset. 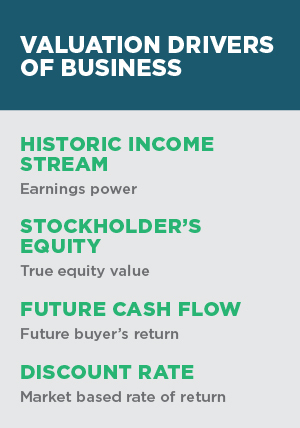 Three basic methods are used for the income and market approach to value an ongoing business: Discounted Cash Flow, Capitalization of Earnings and Selling Comparable methods. Four values or calculations impact the business valuation. If there is a disagreement on the fair market value of a business valuation, it relates to the four valuation drivers of the business listed below. This article will review these four valuation drivers, and describe what is included in these calculations. The value of any business is in its earnings power since an investor expects to earn a return on their investment. A private company often has expenses that another owner might not pay if the business was sold. These discretionary expenses might be: excess owner’s pay, related party transactions, such as, paying above market rents to another company controlled by the business owner, or, promotional or business expenses that were for personal use or simply to reduce the pre-tax profits of the business to lessen the tax bill. To measure the historic income stream, we begin with the ‘accounting net profit’ from the income statement. In order to reflect the actual return to the business owner, we add back any adjustments to profit that reflects an accurate representation of the earnings power of the company. All excess owner’s compensation and any discretionary expenses are added back to the profit. If the owner is performing standard management duties, then only the salary above what would be required to hire someone to perform those duties should be added back. It is common to see ‘one-time’ charges in a company’s financials. One-time charges are expenses that are not likely to occur again. This might be a write down of assets, or a one-time sale of an asset, etc. In the event there is a one-time charge, this should be added to the profit base. It is a common mistake in valuations not to document each adjustment. Have a clear description and explanation of each adjustment. Some valuations will add back depreciation and amortization to earnings because these are non-cash expenses. Adding these non-cash items back to earnings, assumes there will be no reinvestment in the business which will gradually reduce the company’s ability to generate a profit. Therefore, if depreciation and amortization are going to be deducted, the annual capital expenditures should be included to accurately reflect the required capital to deliver future sales and earnings. Stockholders’ equity is also called book value (total assets less total liabilities). When valuing an ongoing business, it is necessary to reflect the current value of the assets. Most discrepancies will likely be found in the fixed assets, intangibles or investment (securities) accounts. Assets are purchased and recorded at cost and then depreciated over allowable recovery periods. Often, assets have been written down significantly and might even be ‘off’ the balance sheet, but they are still fully utilized in operations. This is particularly true with buildings where they actually appreciate instead of depreciate. Due to traditional accounting practices, we need to make the necessary adjustments to reflect the actual value of the assets and add them to the book value. The future income stream of a business is the future economic benefit an owner expects to receive. The income stream can be expressed in alternative ways, such as earnings before interest and taxes (EBIT) or EBITDA, if depreciation and amortization are included. Free cash flow (profit plus depreciation and amortization less capital expenditures and the net change in working capital) is sometimes utilized. “Owner’s Discretionary Cash” (ODC) is normally used in business valuations and is defined as EBITDA, less capital expenditures and working capital changes. Depreciation methods are removed from the equation, and cash flow before interest and debt payments are used, which documents the cash available to the shareholders and debt holders. The table below shows ODC. Some experts place less value on “Owner’s Discretionary Cash” because it is subjective and difficult to project five years into the future. Whichever method of determining income is used, it is necessary to estimate income five years into the future. In addition, the Discounted Cash Flow of a proposed sale of the business in five years, is calculated to include in the future income stream. High risk investments demand higher rates of return. The discount rate is an investor’s expected rate of return, given a specific risk level for the investment. Appraisers uses a “build-up” method to determine the discount rate (table below). The US Treasury Bill represents a relatively risk free investment at 2.57%. Equity investments carry an added Equity Risk Premium and is published by financial reporting companies. A single company risk is not diversified and carries added risk. Therefore, a Company Specific Risk is determined by the strengths of the business and their ability to meet long-term obligations. This calculation is perhaps the most challenging number to validate. By adding these three numbers, we arrive at the “Discount Rate”. Next, we deduct the growth rate of the company which is usually capped at a certain rate. Normally, the growth rate should not exceed the rate of inflation plus GDP growth. Deducting the growth rate from the discount rate gives us the capitalization rate (cap rate). Four calculations: the adjusted EBITDA, any adjustments to book value, the Owners Discretionary Cash, and the Discount Rate, form the basis of all valuations. From here, calculations and market multiples are applied to determine the Discounted Cash Flow, the Capitalization of Earnings and the Market Selling Comparables Method of valuation. If the historic and future income stream is measured properly, the equity or book value is adjusted for any under or overstated values, and the correct cap rate is determined, the ongoing business valuation will be accurate. Take time to accurately develop the correct values. Due to the variance in the three methods, they are normally weighted according to the specific company itself in arriving at the fair market value.